The blossoming of young love between the dashing young Manuel and the two Corazons in the Forties is counterpointed with the dying Manuels search for his one true love in the present day. But which Corazon is it, and will he find her before he joins his Creator? 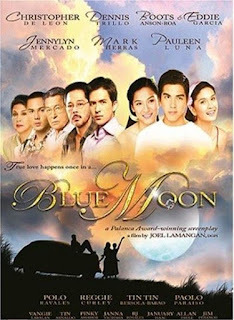 Blue Moon is a 2006 Philippine romantic drama film released by Regal Films and directed by Joel Lamangan. The first choice for this movie's title was Nasaan Ka Man (Wherever You Are), while Nasaan Ka Nang Kailangan Kita (Where Were You when I Needed You) was the second.